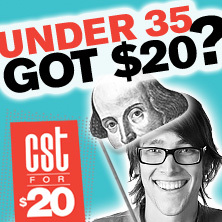 ERIC SCHABLA CHICAGO SHAKESPEARE: Short Shakespeare! Romeo and Juliet. REGIONAL: As You Like It, Born Yesterday, Measure for Measure, Death of a Salesman, The Comedy of Errors, King Lear, Knives in Hens (reading) (American Players Theatre); A Midsummer Night’s Dream, As You Like It, The Tavern (Utah Shakespeare Festival); Earthquakes in London (Guthrie Theater); productions with Children’s Theater of Madison, Back Room Shakespeare Project, Kansas Repertory Theatre, Milwaukee Shakespeare, In Tandem Theatre, First Stage, among others. EDUCATION: BFA Actor Training Program, University of Minnesota/Guthrie Theater.